You may have decided, based on the limited evidence given in Section 1.0, that the climate is warming and that the increase in carbon dioxide is responsible. Or you may have decided that the climate is warming and we do not know why. Or you may think that just because the overall temperature increased by 2°F does not mean that there is a permanent warming of climate � seasonal variation is much greater than this, and it could get cooler again soon, in which case there would be no long-term warming. For each choice, you could find scientists who would support your opinion. However, most scientists actually working on this subject would support the first conclusion. The reason is that the addition of carbon dioxide to the atmosphere must produce warming, a fact derived from our basic knowledge of physics. It is not some obscure hypothesis, but a physical principle that if you add carbon dioxide to the atmosphere, this will increase the "greenhouse effect" and generate global warming in the lower atmosphere. The real debate then is about the amount of uncertainty on the magnitude that will result from this human-made warming (that is, the size of the "error bars" on the data), not the fact of global warming itself. In other words, we know that our addition of CO2 will cause global temperatures to go up; the question is how bad this warming will be and what its consequences will be. The classic ice-albedo positive feedback in response to global warming (also see glossary for a detailed definition of �albedo�). 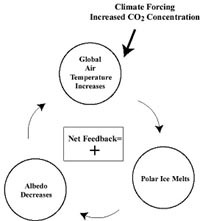 Increased temperature leads to increased melting of polar ice which, in turn, leads to a decrease in albedo. Since albedo is the reflectivity of the Earth�s surface, its decrease leads to even more warming. The resulting correlation of the loop is reinforcing (positive sign). Generally, such positive correlations (also called positive feedbacks) will lead to instabilities. Does the observed addition of the carbon dioxide generated enough warming to explain the observed trend in temperature since 1850? This question is difficult to answer because changes in the greenhouse effect involve a large number of elements of the climate system: changes in water vapor in the atmosphere; changes in the types and abundance of clouds; changes in vegetation; changes in snow cover; changes in soil moisture; and changes in the circulation and the �productivity� of the ocean. All of these effects "feed back" into the climate system and change the amount of warming. This change in warming then changes the system some more, which then changes the warming some more and so on. These sorts of loops whereby the warming of the Earth and the elements that cause warming (or cooling) interact with one another are called �feedbacks.� Feedbacks can be either positive or negative. In simplest terms positive feedbacks act to destabilize the earth�s climate while negative feedbacks act to stabilize it. Most of the attention is given positive feedbacks since they tend to be the most prevalent. Multiple climate feedback systems are exceedingly difficult to handle even by modeling them on a large computer and even when employing very clever physicists to program the computer. Since climate modeling is full of difficulties, there are a few scientists (usually not climatologists) who think they have a better idea of what is going on than the computers. They like to offer their own guesses as to what causes the warming and whether it is permanent or just a fluke. As was the case in the famous chess games between world chess champion Kasparov and the IBM computer, "Deep Blue" (where the computer won), some brains are pretty good at computing, but not everyone is a world champion. Unless you play tournament chess yourself, it is unlikely that you can tell an amateur from a champion. In the case of global warming, chances are these scientists who are trying to outguess the computers are not the world champions. 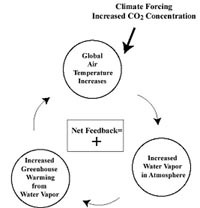 An idealized feedback loop involving water vapor in the atmosphere. Increased temperature leads to increased water vapor in the atmosphere. Because water vapor is a greenhouse gas, increased water vapor in the atmosphere leads to further warming. This is also an example of a positive feedback. What the computer results do show us is that we get increased warming when putting carbon dioxide in the air, and we should expect roughly the amount of warming we have observed so far, considering the various types of gases and particles we put in the air by driving automobiles, producing energy, and even raising cattle.